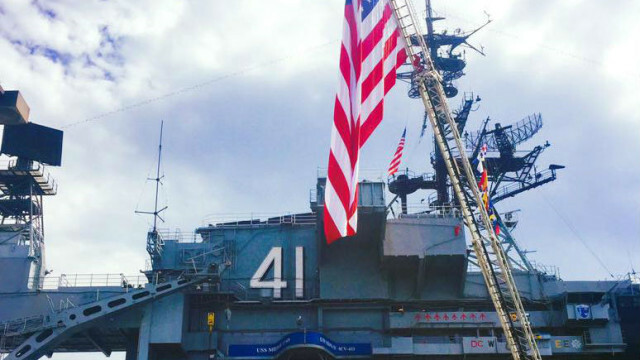 The 75th anniversary of the attack on Pearl Harbor will be commemorated Wednesday aboard the aircraft carrier USS Midway. The 9 a.m. event at the museum will include a wreath dedication and reading of names of Pearl Harbor survivors who have died in the past year. The Midway is symbolic of America’s response to the attack. It is named for the decisive battle just six months after Pearl Harbor in which most of Japan’s carrier fleet was sunk, changing the course of World War II. The anniversary is a stark reminder of the passage of time since the attack in light of the dwindling number of survivors. San Diego traditionally had the largest chapter of Pearl Harbor survivors, but the San Diego Union-Tribune reported that just 19 attended a recent meeting. Ray Chavez, a 104-year-old Poway resident, is among a handful of San Diegans who traveled to Hawaii to mark the anniversary. His ship, the minesweeper USS Condor, was the first to spot a periscope from a Japanese midget submarine that tried to find its way into the harbor but was sunk. By the time Japanese aircraft roared overhead, Chavez — believed to be the oldest survivor of the raid — was off-duty and home. He raced back to his post, where he remained for a week. Also Wednesday, the San Diego Air & Space Museum will display rare items from the raid, including pieces of all three types of Japanese aircraft shot down that day. The items in the exhibit are on loan to the museum from a private collector. The surprise attack by Japanese aircraft on U.S. Navy and Army facilities in Hawaii launched a divided and unprepared U.S. into World War II. More than 2,300 servicemen were killed and around 20 ships destroyed or heavily damaged, including eight battleships. However, aircraft carriers based at Pearl Harbor were at sea that morning and escaped damage.